From the heights of the Bridger-Teton National Forest, stunning views of the famous peaks leave riders in awe at a Jackson Hole treasure. Just outside of Jackson Hole, Wyoming, the family owned Gros Ventre River Ranch boasts some of the most stunning views of any ranch I’ve visited to date–even from the Western-themed, well-appointed main lodge, where I enjoyed animated conversations with guests hailing from destinations ranging from North Carolina to Germany. While gazing at the majestic Grand Tetons and feasting on sumptuous cuisine, I discovered that this destination draws in true horse lovers, with at least one in each group. As a solo female traveler, I felt quite at ease. For my first adventure at the ranch, I strolled to the stable from my cozy rustic cabin, where an old Coca-Cola bottle machine embellished with deer antlers and worn-in cowboy boots added just enough authentic retro ranch flair to really make me feel at home in Wyoming. After visiting with young Halie McGough, who was lucky enough to grow up on this family-owned ranch, wrangler Virginia Dorsey and I saddled up for a trail ride into the Bridger-Teton National Forest. Darley against the majestic backdrop of the Grand Tetons. Once in the saddle, the views got even better. With more than three million acres in western Wyoming, the Bridger-Teton is a vast outdoor playground. 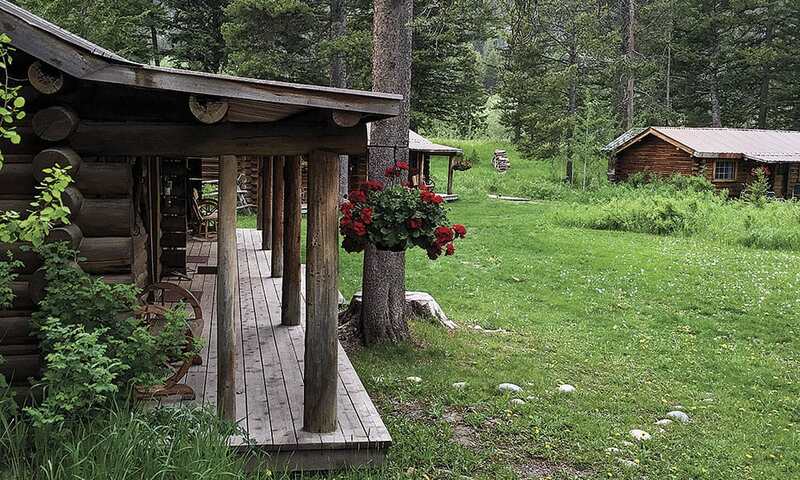 On my first adventure horseback ride, we ambled along trails rimmed with wildflowers and along a serene creek with an historic cabin before plunging deep into the woods, where wildlife abounds. The trails became increasingly steep, giving me another reason to appreciate being horseback! Our destination was above the treeline, and with a few sprinkles at the start of our ride, we considered turning back. The weather can change drastically in this area, making it important to dress in layers and be prepared for anything, even summertime hail. Luckily, the inclement weather held off as our horses took the final switchback out of the woods and we hit a ridgeline. 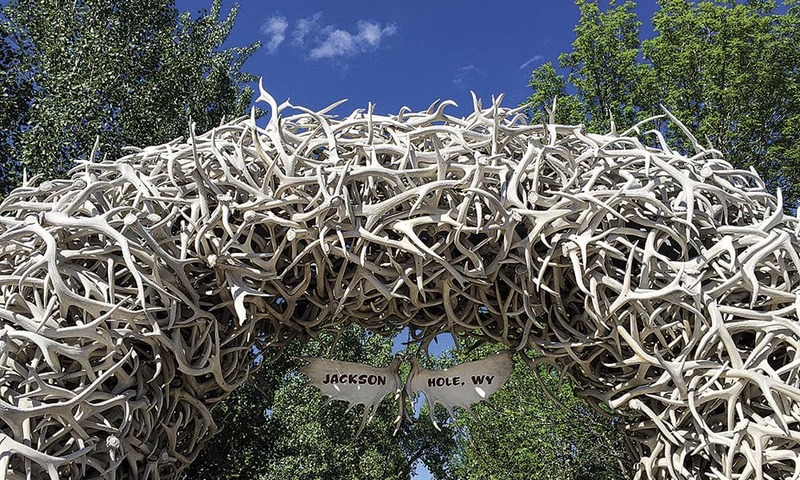 Downtown Jackson Hole’s antler arch on the square. The peaks of the Tetons stretched out into the distance and we rode along in awe of the scenery. 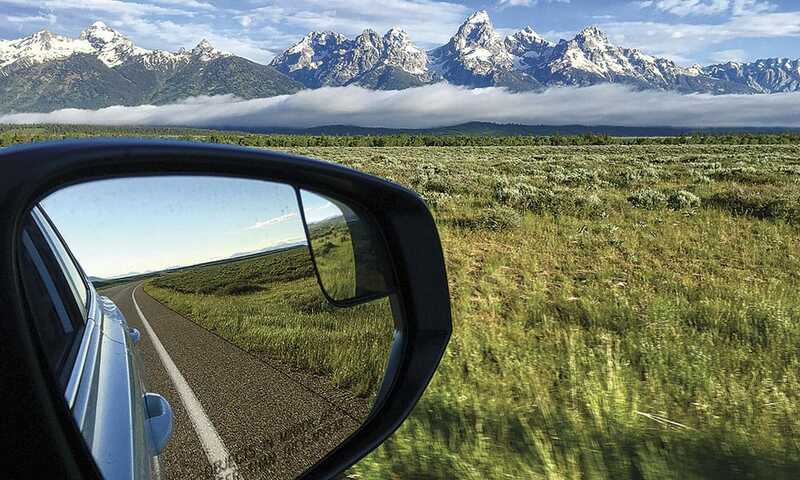 The Teton Range boasts some of North America’s oldest rocks, forming a skyline of jagged peaks. I snapped some of my best between-the-ears shots from the saddle in the Bridger-Teton National Forest. My time at the ranch wasn’t just spent in the saddle. I also went mountain biking in the forest, passing hikers, folks walking dogs, and also along the Snake River, where people were rafting, fly fishing, and surfing … yes, surfing! A short distance from the ranch, surfers can catch a standing river wave at the headwaters of the Snake River, a designated Wild and Scenic River, which also offers great fishing and whitewater rafting. A rustic cabin at Gros Ventre River Ranch. I ventured into downtown Jackson Hole to see the main square with its antler arch and Million Dollar Cowboy Bar, treating myself to a big ice cream cone at Moo’s Gourmet Ice Cream. It’s nice when you can mix outdoor adventure with some Western urban vibes, and this trip to Gros Ventre River Ranch truly captured it all. Many dude ranches have a minimum amount of time you are required to stay during the summer, something to think about when you’re booking. At Gros Ventre, there’s a three-night minimum during most of June and a seven-night minimum during the height of the summer. Whether you decide to saddle up here or at another Jackson Hole dude ranch, book early, as this area is popular year-round and does sell out. 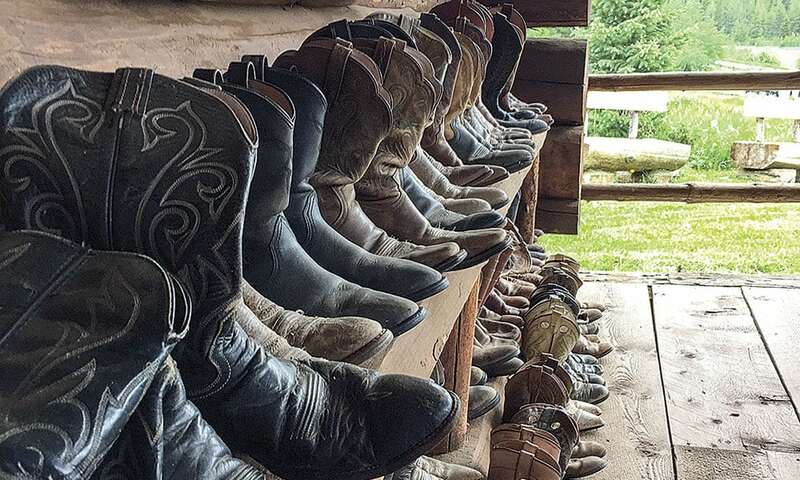 Worn cowboy boots in the stable. 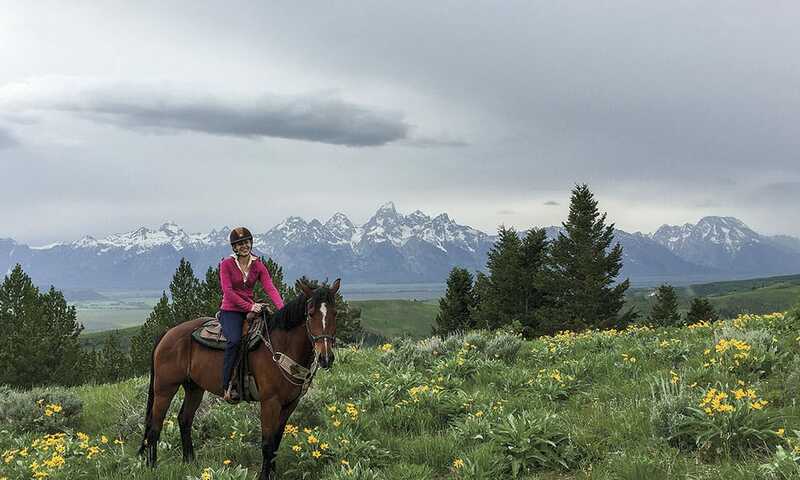 If you’re seeking a guest ranch with good horses, fabulous views, and an atmosphere that speaks to the Old West with a modern flair, head to Jackson Hole and experience Grand Teton views from the saddle. A morning road-side vista of the Grand Tetons. Darley Newman is the five time Emmy Award nominated host, writer and producer of the PBS series Equitrekking (equitrekking.com) and Travels with Darley (travelswithdarley.com), also seen on AOL and MSN. She travels the world with locals, horseback riding in exotic locales to find the best places to travel and ride.